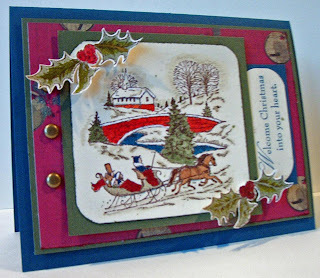 Here is another of the Sleigh Bell cards. I used the same paper, but flipped the card. I do not know why but the colors in this picture are "washed-out". It looks better IRL. Awesome Christmas card! I love all the layering and awesome layout! what a beatutiful Sleigh Bell card!!!! ahhhh... your trademark of beautifully created cards. love it!! very pretty!!! Looks so serene! Nice wintery card on a hot and muggy day! Great colors! Oh my, what a detailed card. Awesome card. The recipient will be thrilled to receive this gorgeous Christmas card.